Carob powder, from the pod of the carob tree (Ceratonia siliqua), is often marketed as a chocolate substitute. While it has a similar appearance to cacao powder — made from the beans of the cacao tree (Theobroma cacao L.) — it has a milder, sweeter taste and offers a significantly different nutritional profile. Both carob and cacao have a place in the health-conscious kitchen, although carob fails to offer the rich mineral content of cacao. Carob and cacao both fit well into a balanced diet. A 2-tablespoon serving of either cacao or carob powder provides approximately 25 calories. This makes up less than 2 percent of your daily calorie intake, if you follow a standard 2,000-calorie diet. Both carob and cacao also provide you with dietary fiber, a type of carbohydrate that may prevent hemorrhoids, fight constipation, lower cholesterol and regulate your blood sugar levels. A 2-tablespoon serving of carob powder boasts a fiber intake of 4.8 grams — a significant amount when evaluating daily recommendations of 25 and 38 grams a day for adult women and men, respectively. Cacao powder contains slightly less fiber, at 4.0 grams per 2-tablespoon serving. Read more: What Are the Benefits of Pure Cocoa? Cacao comes out ahead of carob when it comes to copper and iron content. A 2-tablespoon serving of cacao provides 1.6 milligrams of iron — 9 and 19 percent of the recommended daily iron intakes for women and men, respectively — as well as 409 micrograms of copper, or slightly less than half of your recommended daily intake. Carob, on the other hand, contains a paltry 0.4 milligrams of iron and 69 micrograms of copper. Both copper and iron contribute to red blood cell function, helping to ensure that you have enough functional red blood cells to transport oxygen. Copper also strengthens your bones and supports healthy connective tissue, while iron helps you produce energy. Choose cacao over carob as a source of magnesium and phosphorus. Both of these minerals keep your bones strong and healthy by making up a part of your bone mineral tissue. Phosphorus also helps you make DNA, while magnesium aids in enzyme activation. A 2-tablespoon serving of cacao powder provides you with 81 milligrams of magnesium — 13 percent of the recommended daily magnesium intake for women and 17 percent for men — and also contains 80 milligrams of phosphorus, or 11 percent of the daily recommended intake. A serving of carob, in contrast, provides just 6 milligrams of magnesium and 9 milligrams of phosphorus. 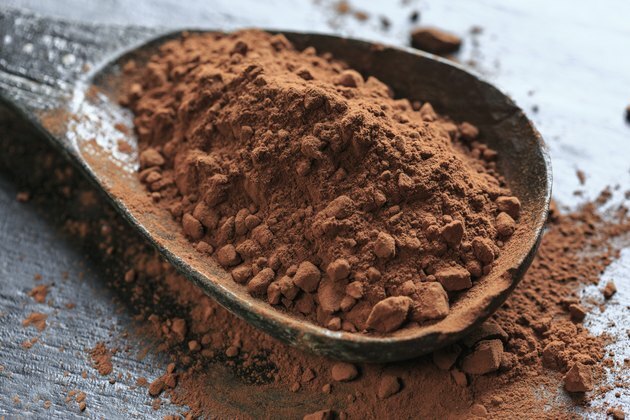 Carob powder lacks the rich, chocolaty flavor of cacao, and using it in your recipes in place of cacao powder is likely to yield less-flavorful results. Instead, use carob when you seek a subtle chocolate taste. Stir it into oatmeal or add it to homemade fruit smoothies. Add more cacao to your diet by baking it into whole-grain muffins, mixing a spoonful into Greek yogurt or heating it with almond, soy or dairy milk for healthful hot chocolate. An impressive attribute of carob and cacao is their high antioxidant content. Antioxidants are important in keeping you healthy by neutralizing the oxygen-based free radicals and environmental toxins in your body. Carob and cacao contain two groups of bioactive antioxidant compounds — polyphenols and flavonoids. Clemson Cooperative Extension says flavonoids may help reduce the risk for developing heart disease, cancer, stroke and even premature aging. According to Cornell University food scientists who compared different chocolate products, cocoa powder ranks highest in antioxidants. WebMD: Fiber: How Much Do You Need? Purdue University: Theobroma cacao L.